At Summer Search, we’re all about creating opportunities. We offer our students exposure to experiences they might not otherwise have, which we are able to do thanks in large part to the generous support from our partners. Summer Search New York City’s partnership with the leading global prestige beauty company The Estée Lauder Companies (ELC) is a model example. As part of their corporate responsibility program, ELC has several Employee Resource Groups. These groups are voluntary, employee-led associations that serve as a resource for their team members by fostering a diverse, inclusive workplace aligned with the Company’s organizational mission, values, goals, business practices, and objectives. Since the spring of 2014, the partnership between ELC’s Hispanic Connections group and our New York City office has evolved into a unique collaboration that has opened up extraordinary opportunities for Summer Searchers. Just ask our student Nathaly Abreu, who recently completed a highly-coveted internship at ELC! Nathaly (center) with Hispanic Connections Co-Chairs Desirée Flores (right) and Mauricio Ubillus (left). “I believe the range of projects I was able to work on as an intern at ELC is incredibly rare, especially in such a large company,” said Nathaly, who is currently a senior at Colby-Sawyer College. After being nominated by the Summer Search NYC College Success team and making it through a rigorous application process, Nathaly began work as an intern on ELC’s Global Corporate Communications team. In her role, she stayed on the pulse of the Company’s news coverage, wrote an article about their Chief Financial Officer winning an award, and got a behind-the-scenes look at a video interview with Fabrizio Freda, the President and Chief Executive Officer of ELC. “I also worked on a confidential social media project!” she added. Opening up ELC’s internship program to deserving Summer Searchers is just one of the ways that our advocates in the Hispanic Connections group are providing exciting and new opportunities for our students, thanks to the dedication and work of the group’s co-chairs Desirée Flores and Mauricio Ubillus. “As a first-generation college student myself, I feel connected to the students and the great work that is done by Summer Search,” said Desirée, a Global Supply Chain Manager at ELC. That connection has led to quite a dynamic, mutually-beneficial partnership. ELC provides financial investment in our program and employees are engaged in a wide range of events in support of our students. Those events give our students a chance to learn and offer ELC’s employees opportunities to lead new initiatives, develop their public speaking skills, and test skills outside of their daily responsibilities. Desirée and Mauricio organized one of these events this past August, hosting our third annual Career Discovery Day at the ELC headquarters in New York City. 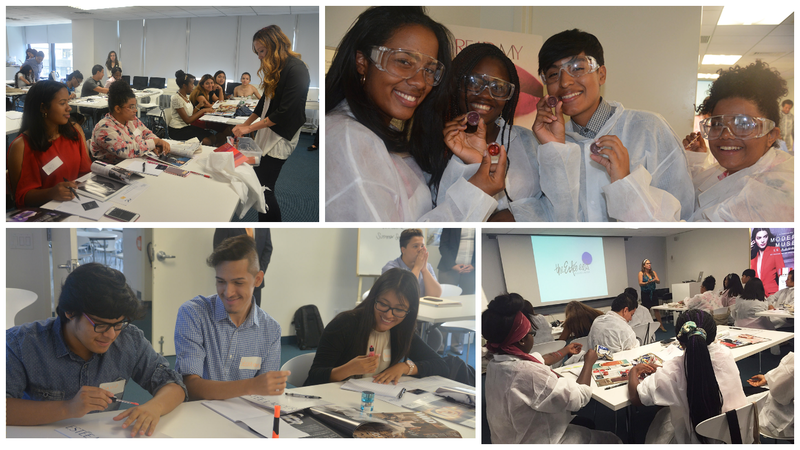 Summer Search students create cosmetic products and marketing plans during this year’s Career Discovery Day at ELC’s New York offices. The day’s program included discussions with some of ELC’s senior executives (which Nathaly helped facilitate), a hands-on workshop where students got to develop their own cosmetic products and create marketing presentations, and an exclusive tour of ELC’s offices. Nathaly (right) leading a Q&A discussion with Maria Cristina Gonzalez, Senior Vice President of Global Public Affairs at ELC, during Career Discovery Day. In the past year, our partnership has expanded to Pennsylvania, where ELC employees from that region have volunteered with Summer Search Philadelphia! Joanna Rocha, Global Supply Chain Supervisor at ELC, serves as the local liaison in partnership with Desirée and Mauricio. 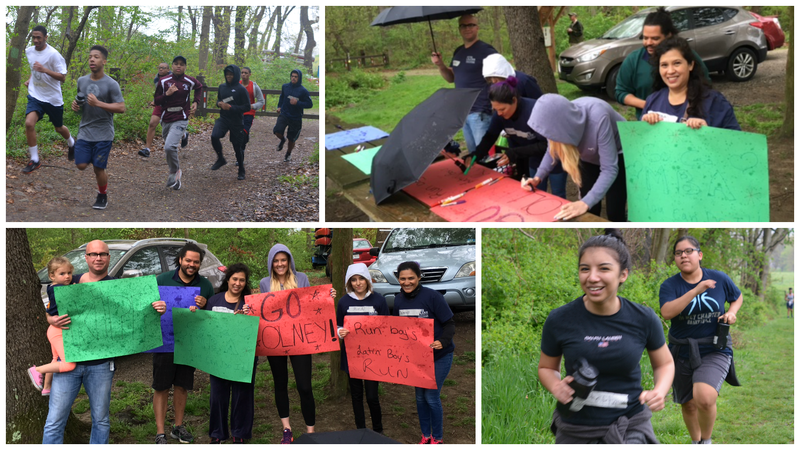 Joanna and several of her co-workers made signs to cheer on Philly’s high school sophomores at their fitness event in April — a 3-mile run to help them physically prepare for their summer wilderness experiences. ELC employees at Summer Search Philadelphia’s 3-mile run. Nathaly sees the parallels between her experience as Summer Searcher and as an ELC intern. Maria Kelts, who works at ELC as an Inclusion & Diversity Manager and has volunteered with Summer Search NYC as a Career Coach, also recognizes those similarities. That culture is one of the things that Nathaly liked best about her internship experience. As for post-college plans, Nathaly is still open to pursuing a number of options. Summer Searchers saying “Thank You” to our many dedicated advocates at ELC, while touring the Company’s executive offices.